Isn't he cute? I love him. He has a very sweet temperament as well. 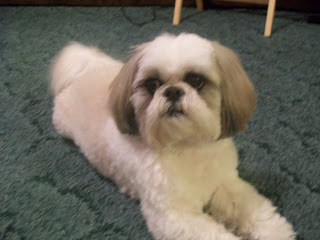 He is my 5 1/2 year old Shih-Tzu. He is awfully sweet & has gotten to be an even better dog since moving in with my hubby. He had too many accidents where i lived before, simply because i was not home as much as i needed to be! Now i'm home a lot more & even if i am in the middle of a busy theatre week, my hubby is home with him. Accidents are EXTREMELY rare, like maybe if he's sick or something - i can't remember the last time he went in the house. For awhile he got in this wierd habit of NOT EATING AT ALL but that is over & done with. Now he makes a happy plate every single time. Another time he got really mean & growly around my husband - i think that was just step-kid syndrome, haha, & eventually it was over, too. He is great on car trips & when we went to the dog park i think he was the sweetest dog there - he sat down & just watched the other dogs, completely content. He also actually listens much of the time - like i can take him out to potty with no leash now (in our own yard) & he will listen if i tell him to come back in the house. The biggest miracle concerning this is that he even came back yesterday when he saw a squirrel! & that is simply a miracle because he ADORES squirrels & simply blocks out the rest of the world when he sees a squirrel. So the fact that he came back in when i called him as he was chasing a squirrel is quite a miracle. Of course those squirrels take off & disappear up a tree, but he is usually still desperately looking for them (he wants to play with them but they don't know that!! HA!) when i start calling him & he used to completely ignore me. No more. Another thing is that my husband taught him to sit & shake!!! I didn't even think a silly shih tzu could learn to sit & shake! He's a good dog. Fievel's favorite past-time...looking out the window. 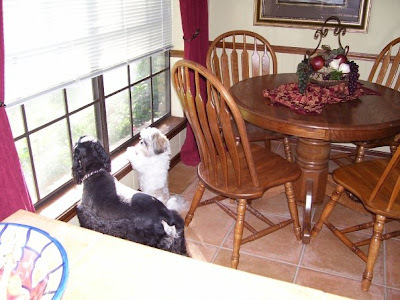 This is he & his "cousin" Bali at my mom & dad's house. The problem is, Cesar, Fievel has recently taken on quite an obsession with bones. Milkbones, that is. It has gotten so serious that this is what Fievel's daily life consists of... He begs to go out, runs out, pees quickly, comes back in & runs straight to the cabinet where the bones are. He scratches. He gets a bone. He eats it & begs for another, which he does not get. He continues to beg. He begs all day. He finally lays down, realizing no one is going to give him a bone. Dad is working on music; mom is in the bedroom playing on her laptop, no one is going to get the dog a bone. Then, if mom gets up to get a glass of water from the kitchen or if dad comes to the kitchen to grab a cup of coffee, the dog immediately assumes they are really coming to the kitchen to get him a bone. He immediately jumps up and runs to the bone cabinet again. At that time, he is also sometimes given a bone. Well, that is how it happened in the past. Now, we have taken to NEVER giving him a bone UNLESS he is being calm & sweet & how we like him. Then we will reward him with a bone. Do you think this is how we should do this? Because HONESTLY this is getting out of hand. Scratch that. It has already gotten completely out of hand. EVERYTIME we move from one place to another in this house he thinks it's to get him a bone. Even if it's in the middle of the night. Even if it's early in the morning. He does this the entire time i'm getting ready for work, the entire time i'm getting ready for rehearsal & the entire time i'm getting ready for bed. Running from me to the bone cabinet to me to the bone cabinet to brad to the bone cabinet. If we decline he will finally calm down until we pass through the kitchen again & then he will jump up & about break his neck with excitement trying to get to the bone cabinet! Did i mention that this is a 12 pound ball of white fur running all around & under our feet?! The sole purpose of his existence is to get a bone! Did i mention that we caught onto the fact that he was scratching on the door JUST BECAUSE he knew if he asked to go out & we took him out then he'd get a bone when he came back in? YEAH! Um...no more! So how to stop the obsessive bone addiction? Take them ALL away? Or give them to him only when he is calm? This is what we are doing now. The only other thing that has worked, is my husband has taken to "pinning him down". It doesn't hurt him... he will just MAKE Fievel lay down on his bed & he will firmly have his hand on him & say very firmly "FIEVEL. STAY." he did that they other day as i was getting ready for work & it was the first time in weeks that fievel stayed put the entire rest of the time i was getting ready! That is my question. Thanks, Cesar. You rock. You could always do as I do (because my dogs have the sweetest saddest eyes) give them a treat EVERY time they ask! haha But seriously. I would do exactly what you're doing now. Ignore him. Ignore him until he calms down and then give him a treat. I also wouldn't give him a treat every time he does something good, because then he will expect it. Just every once in awhile. Way to go on teaching him to sit and shake!! It took Birdie FOREVER to learn to do that...we're still working on getting her to calm down and stop jumping on us...she gets super excited. ps. I am not a dog whisperer, this is only my opinion..if it doesn't work then don't be suprised ha! Oh my gosh! That would drive me nuts hahaha. I of course no NOTHING about dogs... but if it was my kids doing something like this I would either eliminate them all together for a while or make it routine... so like he would only get one when he comes in from going out in the morning. Or only when you get home from work. Dogs catch on to those kinds of things too right? YOUR DOG is so cute!! 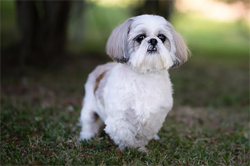 I have a little Shih tzu/Maltese Mix! She loves loves loves to play!! Everytime we go outside and she uses the bathroom she runs...... in the home like full sprint to get her a treat, she then goes to hide it and comes back for a 2nd one then goes to them both. She is so stupid when she is playing in the house. i may just have to video it for all to see!! okay so we have those bones for my dog too!!! he gets ALL KINDS of excited about them too!!! he got to the point where he would ask to go outside to earn his bones and eat enough to not eat any of his actual dog food!!! he lived off of milbones for about three solid days before we cut him off!!! 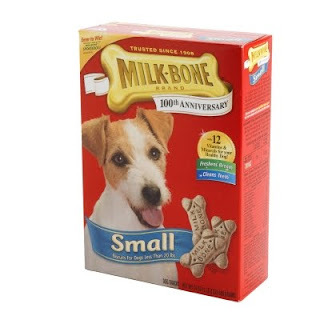 Maybe Cesar should inspect the milkbone factory facility!!! !